Truck Facts: 2001 Chevrolet K3500. 557ci Keith Black engine-1500 horse power. Knight Stalker externally adjustable gas racing shocks, 66x43 inch Goodyear tires. Estimated build time is 4 months. Racing Background: Former BMX bicycle and motorcycle racer. 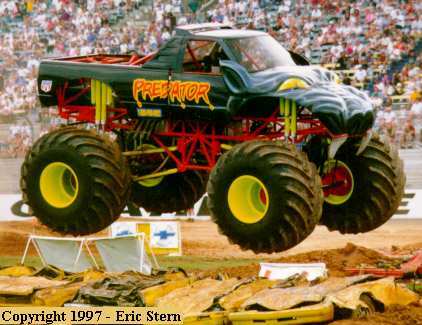 Began monster truck racing in 1984 at age 16. Outstanding Achievements: Finished 9th in the 1996 PENDA points series. Won Canfield, Ohio race number 3 during the PENDA points series tour in 1996. Won the 1996 "Wekend from Hell" award for his 3 blown engines and broken rear axle in Indy. Voted 1994 Monster Truck team of the year. Featured in Sports Illustrated magazine, on Good Morning America and the Today show.